(CNN) -- A six-month-old baby had a miraculous escape after his stroller rolled off a railway station platform and into the path of an incoming train. The stroller rolling towards the edge of the platform. The incident, which happened Thursday at Ashburton railway station in Melbourne, Australia, was captured by CCTV. 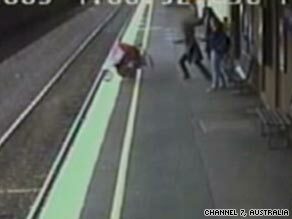 The footage shows the baby's mother momentarily letting go of the stroller, which then rolls over the edge of the platform. Second later, a train pulls in to the station. The stroller and baby were dragged 30 meters (33 yards) further up the track before the train came to a halt. John Rees, a spokesman for train operator Connex, told Australia's Channel 7 television station: "It's a miracle this baby wasn't killed. The baby managed to escape with just a cut to the forehead, I'm told. It's a complete miracle." The baby boy was quickly reunited with his distraught mother. He was taken to Melbourne's Royal Children's Hospital but was later discharged. Channel 7 said the incident came just a day after the launch of a public awareness campaign warning of the dangers of strollers on platforms. Victoria state police sergeant Michael Ferwerda told Channel 7: "Parents especially need to be vigilant especially with toddlers."